9 Then they said to one another, “We are not doing right. This day is a day of good news. 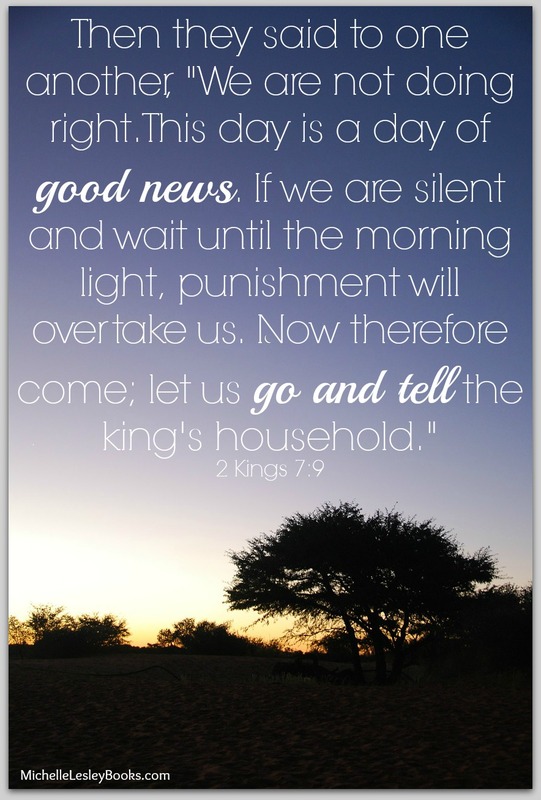 If we are silent and wait until the morning light, punishment will overtake us. Now therefore come; let us go and tell the king’s household.” 10 So they came and called to the gatekeepers of the city and told them, “We came to the camp of the Syrians, and behold, there was no one to be seen or heard there, nothing but the horses tied and the donkeys tied and the tents as they were.” 11 Then the gatekeepers called out, and it was told within the king’s household. 12 And the king rose in the night and said to his servants, “I will tell you what the Syrians have done to us. They know that we are hungry. Therefore they have gone out of the camp to hide themselves in the open country, thinking, ‘When they come out of the city, we shall take them alive and get into the city.’” 13 And one of his servants said, “Let some men take five of the remaining horses, seeing that those who are left here will fare like the whole multitude of Israel who have already perished. Let us send and see.” 14 So they took two horsemen, and the king sent them after the army of the Syrians, saying, “Go and see.” 15 So they went after them as far as the Jordan, and behold, all the way was littered with garments and equipment that the Syrians had thrown away in their haste. And the messengers returned and told the king. 1. What events led up to this story? Why was the situation so dire? 3. How do the lepers (v.3-4) symbolize people, pre-salvation, who are lost and dying and on their way to hell? Which of their words and actions symbolize a sinner throwing himself on the mercy of Christ? What might their actions in verse 8 prefigure for a new Christian? 4. What were the lepers doing that was not right? (v.9) Is it right for Christians to keep the good news of the gospel to themselves? Do you see any parallels between the lepers’ story and the story of the prodigal son? 5. Elisha’s words from verses 1-2 came true in verses 17-20, and he continually pointed Israel back to the one true God. This tells us that God really was speaking through him and he was a true prophet. Contrast this with the two proofs of a false prophet in Deuteronomy 13:1-3 and 18:20-22. Have you ever heard a modern day “prophet” give a prophecy that did not come true or point people to a “God” or a “Jesus” that doesn’t match up with what Scripture says about Him?